“Of course The $99 Bouncy House is our most affordable jumper and has 360-degree mesh windows, so parents and spectators can have a clear view of all the fun. Our moonwalks are made safe and secure with lite n strong, fire-resistant vinyl making it safer, portable and more durable,” says Bowling. The medium-sized Castle 2 will let your attendees have a royal bouncing time in this bright and happy bounce house. Little princes and princesses will rule in this brilliantly-colored castle with hues of orange, blue, red, green and yellow, perfect to suit any party theme, or to stand out during a busy event. Bouncy Fun Rentals will deliver and set up their high-quality vinyl bounce houses at your party according to your specifications. Their service professionals will also provide you with a comprehensive safety lecture regarding the bounce house’s safety features and its operational guidelines to ensure the safety of the children who will be playing in it. Bounce houses are not only unique party rentals; they also provide a fun way for children to exercise and take part in aerobic activity. Bouncy Fun Rentals also provides party rentals in Seymour, Indiana in the form of bounce castles, a 12 foot inflatable movie screen with an attached Xbox 360 gaming system, karaoke machines, and (new this year!) 18 foot wet or dry slides for all of your party needs. Their prices are incredibly affordable, and all of their rentals last for a full 24 hours unless otherwise requested. Bouncy Fun Rentals will take care of all of the setup, take down, and cleaning of the equipment; all you have to worry about is having fun! Bouncy Fun Rentals also believes in paying it forward to the Seymour, Indiana community. Their company is the only company which has Carson’s Gift. Based on a conversation Bowling had with his then four year old daughter, Carson, he decided that other children in the Seymour, Indiana area should be able to have the opportunity to have a memorable bounce house party, even if their family is unable to afford it. With that in mind, Bouncy Fun Rentals offers two completely free parties for children from a list of nominees each year so that they can have a party that they will always remember. Carson’s Gift is all inclusive: Bouncy Fun Rentals will provide the bounce house and enough pizza and cake for up to a dozen kids. Bouncy Fun Rentals is the premier party rental service in Seymour which takes its dedication to fun very seriously. In ordering your party rental through Bouncy Fun Rentals, you will also be helping support the Carson’s Gift program and know that not only are you helping your child have a memorable day; you can help someone else’s child have the party of a lifetime as well. 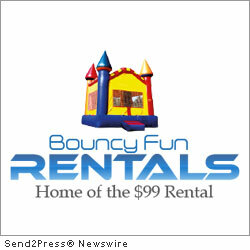 News Source: Bouncy Fun Rentals :: This press release was issued on behalf of the news source by Send2Press® Newswire, a service of Neotrope®. View all current news at: http://Send2PressNewswire.com . Bouncy Fun Rentals, bouncy house seymour, Business, Family, Indiana, Retail and Franchise, Seymour, seymour party rentals, SEYMOUR, Ind.